Kettering Town laid a ghost to rest last weekend and Marcus Law is keen to see his team do it again tomorrow (Saturday). 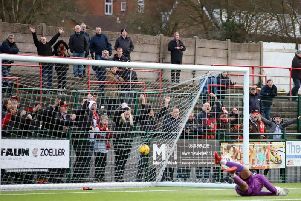 The Poppies maintained their five-point advantage at the top of the Evo-Stik League South Premier Division Central with a 4-1 success at Redditch United having been held to a 4-4 draw by the same opponents at Latimer Park at the end of November. And Kettering will be keen to set another record straight this weekend when they make the short trip to St Ives Town, who stunned Law’s team with a 3-0 victory at Latimer Park just four days after that eight-goal thriller against Redditch. It was one of the rare bad days for the Poppies this season as they also had Dan Holman sent-off, although the red card was rescinded the following the week. But the stakes are even higher now with Kettering looking to maintain their advantage over Stourbridge at the summit. If they can continue their winning ways the title will only draw closer. And Law, whose team have now put together a run of four victories in a row, said: “That’s the pressure, isn’t it? “We need to make sure people don’t get complacent but we need to make sure we get the balance right between pressure and relaxation to bring out the quality. “I thought we got that spot on last weekend. “We put to bed the result we had at home against Redditch and ironically, we find ourselves in a similar situation this weekend. “St Ives really stung us at our place. We had the red card in that game that was eventually overturned but it was a bad day. Law expects to have a fully fit squad to choose from tomorrow with the only change in personnel being the return of Ben Toseland, who has been at loan at St Ives for the past month, while Tom Knowles has now returned to Cambridge United following his temporary stint at Latimer Park.